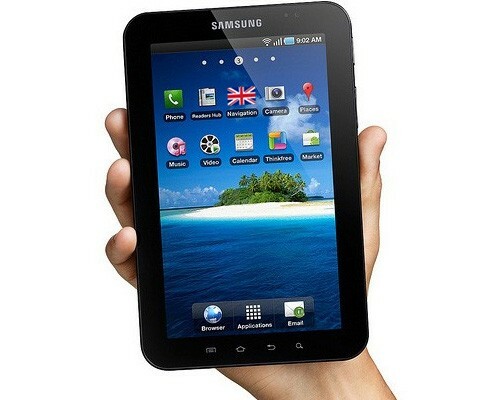 Samsung has just issued a press release detailing the availability of their new iPad competitor, the Samsung Galaxy Tab. They have officially announced a Monday, November 1st launch date in the United Kingdom and have also noted that all major carriers will carry the Android 2.2 enabled device. The device will also be available through Carphone Warehouse. However, the one important thing you want to know, pricing, still isn’t being made available. London, UK, October 1st, 2010 – Following last month’s global launch at IFA, Samsung Mobile today announces the Samsung Galaxy Tab (GT-P1000), will be available in UK stores from Monday 1st November. Representing a new category of mobile products for the company, the Galaxy Tab features a 1GHz processor, Google’s Android 2.2, Froyo operating system, a front facing camera for video calls and a 7-inch TFT-LCD display. It can be used for everything from watching films and TV, viewing pictures, reading e-books and sharing documents, to talking to friends and colleagues via voice and video call, e-mail, instant messaging, SMS/MMS or social networking. The light (380g) weight of the Samsung Galaxy Tab means it is extremely portable, with its dimensions easy to grip and use, it is perfectly sized for life on the go. Supporting the latest Adobe Flash Player 10.1, the device allows people to quickly and easily surf and view pages on the internet. The ‘Readers Hub,’ Samsung’s unique e-reading application, provides easy access to a digital library, featuring everything from classical literature to the latest bestsellers and reference materials. In turn, films, videos and music are available via ‘Media Hub’ and ‘Music Hub’ applications, whilst all personal contact details, e-mail, calendar, social networking and instant messenger accounts, can be combined in the ‘Social Hub’. The Samsung Galaxy Tab will be available in the UK across all major networks, key high street and out of town electrical retailers and online such as Carphone Warehouse, Dixons Store Group and T-Mobile. The Galaxy Tab will be available on a range of attractive price packages, making it as widely accessible as possible to all consumers. For more information please visit www.samsung.com/uk/Galaxytab. Finally I have decided to get a tab for me, but still confused which one to buy. Apple’s ipad has no flash and due to which I am more inclined towards Samsung Galaxy tab. Being an expert and I hope you are/have been using iPad, what do you suggest to me? ?